Thomas de Mowbray was the first Duke of Norfolk. His mother, Elizabeth de Mowbray, Baroness Mowbray and suo jure 5th Baroness Segrave, was the eldest daughter of Margaret Plantagenet, Duchess of Norfolk (and being the eldest daughter of someone who died 1399 makes you one old lady!) who was in turn the eldest daughter of Thomas of Brotherton, 1st Earl of Norfolk, was the seventeenthish1 child of Edward I, [former as of 1307] King of England. Mr. Edward was a tall bloke. Actually, only 6'2", but they called him 'Longshanks' anyway. Anyway, Thomas de Mowbray, 1st Duke of Norfolk got in an argument with Henry of Bolingbroke, 1st Duke of Hereford (who's most famous for usurping the throne to become King Henry IV and a title for a couple plays by that English playwrite.) So, Thomas de Mowbray, 1st Duke of Norfolk got banished (along with the future king). He's featured in aforementioned playwrite's play named after the guy who banished him. But I'm not here to tell you about Thomas de Mowbray, 1st Duke of Norfolk. My point is the other Thomas de Mowbray, this one being the fourth Earl of Norfolk. And he's the son of the guy I just rambled on and on and on about. Thomas de Mowbray, 4th Earl of Norfolk was beheaded, by which I mean deheaded. Now, the point is, this headless man, Thomas de Mowbray, 4th Earl of Norfolk, had both a brother named John de Mowbray, 2nd Duke of Norfolk and a son named John de Mowbray, who just so happened to be (after Thomas quit due to nonheadedness), the second Duke of Norfolk. (What a numbering system they had in those days! Brits. I tell you.) And he had a grandson, John de Mowbray, 3rd Duke of Norfolk, whose only son was John de Mowbray, 4th Duke of Norfolk. And Thomas de Mowbray, 4th Earl of Norfolk's grandfather was John de Mowbray, 4th Baron Mowbray. Now, my actual point--and I know I keep saying 'my point is' when it really isn't, but I'm telling the truth this time--is that when I was fairly young, I memorised all the presidents of the US2 in order. And I could recognise their portraits. The closest thing we had to duplicate names were John Adams and his grandson John Quincy Adams. 1 Wikipedia lists only five children for Edward I, probably because most died in infancy. One of the survivors (until 1284), Alphonso, Earl of Chester died at age ten, but was still apparently Earl of Chester, except maybe he wasn't actual and is only considered so retroactively. Alphonso's mother, by the way, was considered a 'greedy foreigner' by the general public, but she bore sixteen children and didn't eat any of them, which makes her better than Britain's own Johnathan Swift. But she's not Thomas of Brotherton, 1st Earl of Norfolk's mother. Thomas of Brotherton, 1st Earl of Norfolk's mother was Marguerite of France. 2 Yes, I know Dukes and Earls and junk aren't analogous to presidents. Shut up. I needed something to post, and this is it. It's also the longest, most boringest post in the history of this blog. Gosh golly gee whiz, who the heck will want to read this mess? You have to write to them and tell them not to do stupid things. They probably won't listen, but you're obligated to try. In 2001, I told my reps 'Pay UN dues. UN good.' A few months later I told them 'RIAA bad.' About the same time, I wrote to say 'SSSCA bad', so they renamed it. One of my former reps voted against the USAP AT RIOT Act, so I wrote to say 'You good', which was a refreshing change. Then in 2005 I wrote other reps to let them know that 'Nuclear war with Democrats bad'. Of course, the actual letters tend to be a few hundred words, not just two words. Okay, I was taking photos. And people I knew online were there. I think. But then my camera ran out of power. And was almost full. So I had empty it out onto the laptop, but I was aware that this was a dream, so I was all 'can't I just decide it's been done? You know, fast forward?' but I knew I couldn't 'cause I'd know I hadn't really done it. So I thought 'Well, how about I've written a tiny scripts to handle it for me?' and that was okay, but the camera wasn't totally full; that wasn't the problem. It was out of power. And recharging takes a while. I don't think it occurred to me that I could run out and buy a second battery. Or maybe it did and that was unacceptable as well. Lucid dreaming sounds fun until you discover your mind is so logical that it won't even let you bend reality in your dreams. Though how I copied photos from my camera when the batteries were dead, I don't know. I hadn't a chip reader. And this was internal memory. 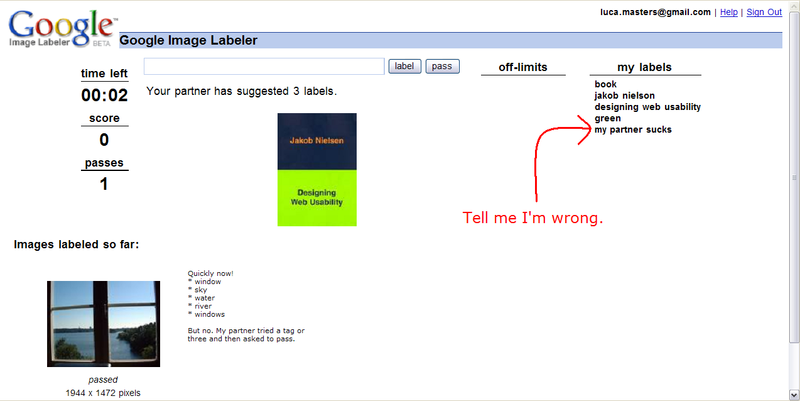 I had some fun with the Google Image Labeler a month or two ago and some more tonight. It's fun. * An image won't load. Major annoyance. * My partner won't do anything. Maybe they quit. * My partner will do stuff, but somehow, he's incredibly stupid. 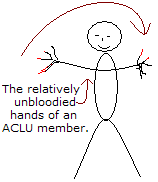 I just joined the ACLU. What's that? You say you're a member too? Don't worry. This post can still be saved. Oh, wait! You're not an American, you say? Your nation doesn't do that whole 'torturing people' thing? Fine. Be that way. Neither of us has much people-torture blood on our hands. If you get caught in a vacuum, your blood boils and things explode, correct? But suppose you're not quite caught in a vacuum. Suppose you're flying along in your lovely rocketship with 1-inch thick walls and some big lug flies by and pokes a small hole in your hull. Obviously you'd wan to stop up the hole through which all your oxygen is leaking, as is the lovely smell of those chocolate chip cookies you just baked. So thinking quickly, you stick your thumb in the hole. Does your thumb explode? Do the capillaries burst and you begin to lose blood at an alarming rate. (And if so, how many cookies must you eat per minute in order for your body to have enough sugar to replace the lost blood. How many litres of soy milk must you down with these cookies to replace the lost fluid that is literally and non-metaphorically the life-blood of your circulatory system? If you pull your thumb out and stop up the hole with a cookie-crumb-covered napkin, will your thumb recover, or will it be a bloody mess for the rest of your life? Clearly, this is unhappy. So perhaps instead of sticking your thumb in the hole, you merely press it against the hole. Will the skin explode but the rest of the thumb still manage to block the air's escape? Will your new lack of a thumbprint on one hand lead you down the dark path of criminal behaviour? If any of you happen to have a vacuum you can test with, please do so. However, because we'll be wanting your results typed out, you'd best do the testing on a toe rather than a thumb.